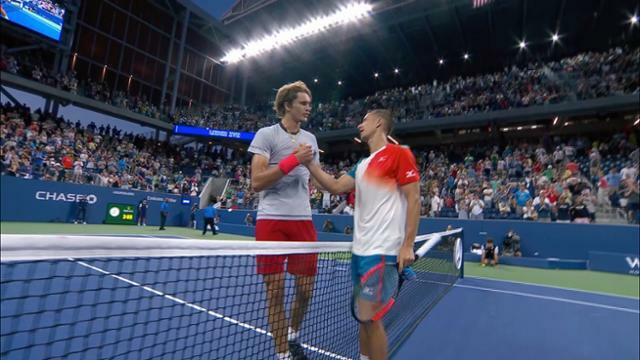 WHAT HAPPENED: Not even Ivan Lendl, a three-time US Open titlist, could help Alexander Zverev's consistent Grand Slam struggles this fortnight in New York. The fourth-seeded German suffered another early Grand Slam exit on Saturday night, falling to countryman Philipp Kohlschreiber, 6-7, 6-4, 6-1, 6-3, in the third round. It was Zverev's best showing in New York, but well short of the 21-year-old's aspirations for the season's final Grand Slam tournament. The right-hander came into New York eyeing a title, or at least another Slam quarterfinal after making his first at Roland Garros (losing to Dominic Thiem). Zverev changed his New York routines, going out less and hanging out with family more in an attempt to make his stay in the city of eight million more routine, more mundane. He added Lendl, who had been instrumental in helping Andy Murray win his first Grand Slam title at the 2012 US Open, to his team. But, for the third time this season, Zverev exited a Grand Slam in the third round. The 34-year-old Kohlschreiber hadn't beaten a top 5 player at a Grand Slam since the 2009 Roland Garros, when he swept then-No. 4 Novak Djokovic (now 2-10 overall). He hadn't beaten Zverev in three years, since the 2015 US Open. But Kohlschreiber kept him off-balance and took advantage of an up-and-down day from the 21-year-old, who never looked settled inside Louis Armstrong Stadium, despite having beaten Kohlschreiber last year on grass and earlier this year to win the Munich clay-court title. Zverev nearly blanked Kohlschreiber in the first-set tiebreak to overcome a sloppy game at 5-3, when he served for the opener but double faulted and shanked a volley to get broken. Kohlschreiber, however, pressured Zverev and broke to love in the 10th game of the second to even the match. The veteran dictated rallies with his one-handed backhand and kept Zverev guessing with a mixture of slice and topspin from his backhand wing. The 6-foot-6 Zverev won less than half of his 41 trips to the net (49 percent, 20 of 41). He handed Kohlschreiber a double-break lead in the third set with a double fault, one of his seven on the day. Zverev finished with 53 unforced errors to 39 winners. September 1, 2018 - Alexander Zverev in action against Philipp Kohlschreiber at the 2018 US Open. September 1, 2018 - Philipp Kohlschreiber in action against Alexander Zverev during the 2018 US Open. September 1, 2018 - Philipp Kohlschreiber in action against Alexander Zverev at the 2018 US Open. September 1, 2018 - Alexander Zverev in action against Philipp Kohlschreiber during the 2018 US Open. September 1, 2018 - Philipp Kohlschreiber waves to the crowd after winning against Alexander Zverev during the 2018 US Open. “I think I do quite well against big guys,” Kohlschreiber said. “I move around the big guys a lot. Obviously that's maybe one of not their strengths." Five times in 2018, though, including three at Roland Garros, Zverev had been down two sets to one, and all five times he had come back to win the match. He led by an early break in the fourth, 3-0. But Kohlschreiber won the final six games to make his fifth Round of 16 in Flushing (5-3 in third-round matches). “He has everything. He can use a lot of topspin, can hit the ball flat, use a lot of slice. He can mix it up well. It's tough to get a rhythm against him sometimes,” Zverev said. WHAT IT MEANS: New Louis Armstrong Stadium, same Philipp Kohlschreiber. The German, who beat American John Isner in three straight third-rounders at the Open (2012-14), including two inside Louis Armstrong Stadium, struck again on Saturday night to take out another big-hitting righty. Kohlschreiber will try to reach his second Grand Slam quarterfinal (2012 Wimbledon, lost to Jo-Wilfried Tsonga) when he faces 2014 US Open finalist Kei Nishikori of Japan. The German is 1-9 in Grand Slam fourth-round matches. For Zverev, it's another Slam that ends in disappointment. But the German still has much to play for in 2018, including a return appearance at the ATP Finals in London in November. Last year he became the youngest qualifier at the season finale since Juan Martin del Potro in 2008. MATCH POINT: In Indian Wells in March, Kohlschreiber beat then-No. 3 Marin Cilic of Croatia to snap a 12-match losing streak against Top 10 players. September 1, 2018 - Roger Federer reacts to beating Nick Kyrgios at the 2018 US Open. September 1, 2018 - Roger Federer in action against Nick Kyrgios at the 2018 US Open. September 1, 2018 - Nick Kyrgios in action against Roger Federer at the 2018 US Open. September 01, 2018 - Mikhail Kukushkin against John Millman at the 2018 US Open. September 01, 2018 - John Millman after defeating Mikhail Kukushkin during the 2018 US Open. September 1, 2018 - Kei Nishikori in action against Diego Schwartzman during the 2018 US Open. September 1, 2018 - Diego Schwartzman in action against Kei Nishikori during the 2018 US Open. September 01, 2018 - David Goffin in action against Jan-Lennard Struff during the 2018 US Open. September 01, 2018 - Jan-Lennard Struff in action against David Goffin during the 2018 US Open. September 1, 2018 - Richard Gasquet in action against Novak Djokovic during the 2018 US Open. September 1, 2018 - Novak Djokovic in action against Richard Gasquet during the 2018 US Open.